Lenovo K6 Note has got official Android 7.0 Nougat firmware. The Nougat 7.0 firmware has come with several bug fixes and improvements. Android Nougat 7.1.1 has May 1, 2017, security patch with good performance and new features. The OTA has rolled out but at the same time don’t get everyone notification. Many users are got the OTA notification but some are pending to receiving the OTA message. So if you got the OTA notification then follow up on-screen instruction and update Lenovo K6 Note to Android Nougat 7.0. Others way you are the pending list and you can’t wait for official notification. 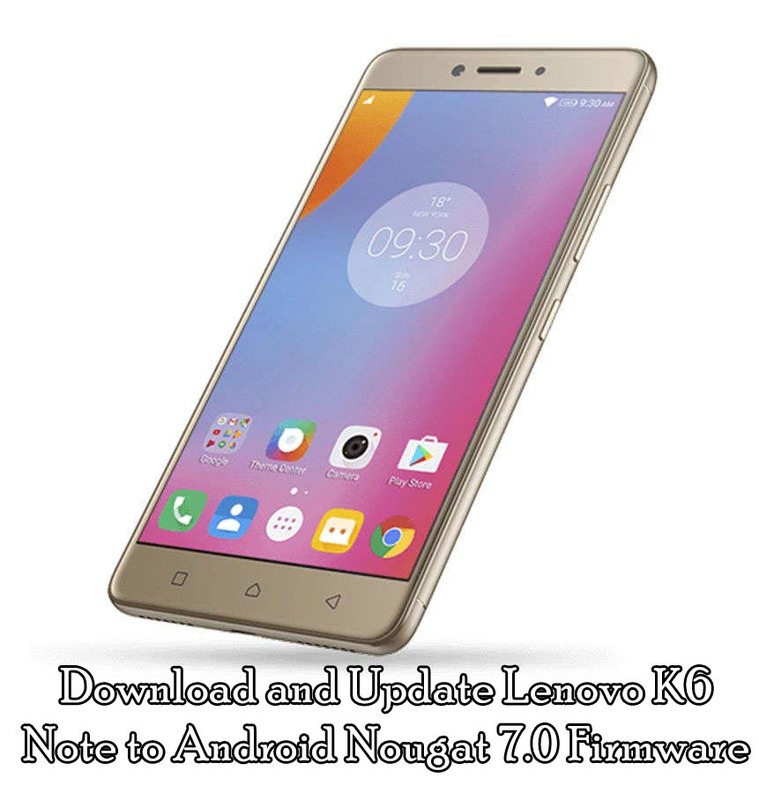 Then follow below step by step guide and update Lenovo K6 Note to Android Nougat 7.0. With easy and simple method manually. Below we share the official Android Nougat 7.0 firmware for Lenovo K6 Note smartphone via manual method. Firstly, applying the official firmware on your device check the update, simply go to setting> About Phone> System Update. If you didn’t find the update then follow below step by step guide and update Lenovo K6 Note to Android Nougat 7.0 via manual method. Before proceeding the process, read important info first and the get towards the main updating guide. The below guideline only for Lenovo K6 Note (K53a48_S123 to K53a48_S218) devices. Don’t follow the given tutorial for any other variants. Follow up step by step guide and don’t miss any step, cause if you something messed up and the process goes wrong. Then we will not responsible proceed at their own risk. Charge your Lenovo K6 Note at least 60% and then move up the process. Backup your important data and save to safe location, first of updating steps. Then go to Settings > About phone > Build number and tap it 7 times to enable Developer options on your device. After that go back to Settings >Developer options and enable USB Debugging and OEM unlocking. To ensure you have 2GB space left before starting the updating process. Step 1: First, download the K53a48_S218 OTA for Lenovo K6 Note from the above link. Step 2: After downloading save the K53a48_S218 OTA on your device. And rename the file to Update.zip. Step 3: And then Boot your device into Recovery mode. For to do press and hold Volume UP + Power button at the same time for a while. Once the logo screen appears released the button, and use the Volume UP and Down key for navigating and Power key for confirming an option. Step 4: Now get Nandroid Backup and then perform a Factory Reset, simply go to Wipe > Advanced Wipe, select “wipe cache”, “Dalvik cache”, “System” and “data” and swipe to confirm it to perform the process. Step 5: After that, go to the main menu and select install option and locate the update.zip file. Swipe to install the ROM file on your device. Step 6: Once complete the process, then go back and wipe cache, Dalvik cache and then Reboot your phone. That’s it! This is the simple and easy method to update Lenovo K6 Note to Android Nougat 7.0. Share your feedback about this article. If you have any question comment below, we try to contact you ASA possible.